Looking for Assistant Professor jobs in Arts & Science Colleges 2019 in Tamilnadu? or Searching for Faculty Teachers Tamil Nadu April 2019? 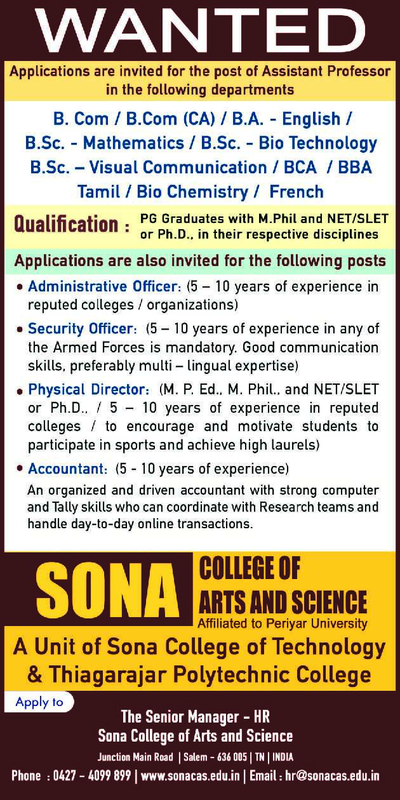 A college based in Salem named Sona College of Arts and Science, Salem has advertised in THE HINDU newspaper for recruitment of Assistant Professor Plus Non-Faculty jobs vacancies. Interested and eligible job aspirants are requested to apply as soon as possible from 10th April 2019. Check out further more details below. About College: Sona College of Technology & Thiagarajar Polytechnic College have been pioneers in Indian Technical Education for more than 60 Years. Being top ranked NIRF and AICTE - CII awarded Institutions, the Sona Group is known for its collaborative programmes with industries and successful placement rates. Situated in the heart of the steel city, Salem, Sona Group enjoys the reputation of being the best destination for technical education aspirants. With this strong foundation and experience, the Sona Group steps into a long cherished dream venture of establishing an Arts and Science College to cater to the needs of students aiming to experience an enriching and enlightening arts and science education. How to Apply: Interested and eligible candidates are requested to send their CV along with copies of certificates, testimonials and recent Passport Size photograph to the postal address or email address mentioned below. Salem - 636005, Tamil Nadu, India.